THE MAIN MEASURES from Budget 2018 are out and you can see everything you need to know about how it affects you here. Details of how Budget 2018 will be implemented will be fleshed out and debated over the coming days. 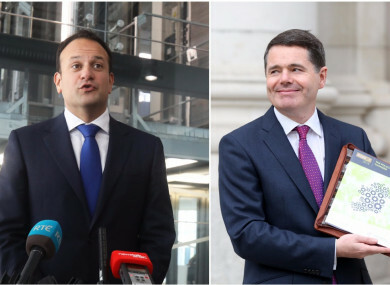 But tomorrow night at 8pm on Facebook Live, Taoiseach Leo Varadkar and Finance Minister Paschal Donohoe will be speaking to TheJournal.ie audience about why they made the decisions they did and how they see the distribution of funds working for sections of Irish society. We want you to submit your thoughts and questions on the decisions made in Budget 2018 so that we can put those to Minister Donohoe and Taoiseach Varadkar. - Do you think this was a fair Budget? - What do you think they got right? - What do you not understand about the choices they made? Email “What's behind the Budget 2018 decisions? YOUR chance to ask Leo and Paschal”. Feedback on “What's behind the Budget 2018 decisions? YOUR chance to ask Leo and Paschal”.